PROOF OF LIFE by J. 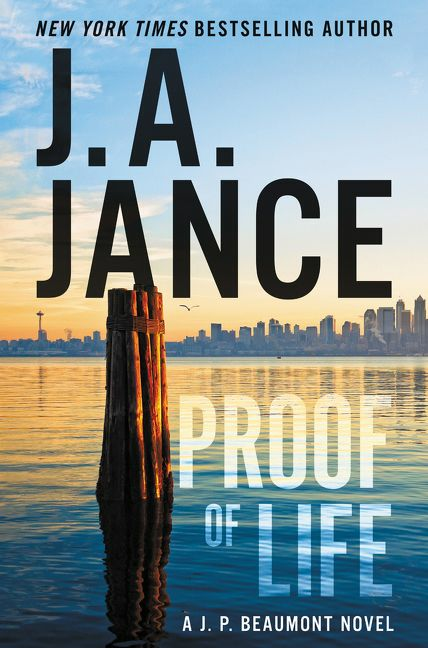 A. Jance brings back retired detective J. P. Beaumont. The difference between these novels and the other series Jance writes is that these blend sarcastic humor within the mystery. Now retired Beaumont (Beau) searches for something to keep him busy. But thanks to his longtime nemesis Seattle crime reporter Maxwell Cole, Beau becomes entangled in an investigation. It seems Cole put in his will that Beau should scrutinize his death. Although ruled an accident, it appears that there are clues that lead to the death possibly being ruled a homicide. It is up to Beau and his police chief wife Mel Soames to sort everything out and connect the dots. Intertwined within the mystery is a shout out to man’s best friend, dogs. Beau and Mel adopt an Irish Wolfhound named Rambo aka known as Lucy. It seems he is a she and is very determined to make sure the police couple know they have an addition to their family. Readers will enjoy the descriptions of raising a dog and the relationship between the furry friend and her owners. PROOF OF LIFE has a story that will make readers cry, laugh, and look over their shoulder. It is a page-turner not only for the riveting plot, but also to find out what will happen to Rambo and Beau’s relationship.